Michael Kuse, son of George Anton Kuse, Jr. and Kathleen Cruise, was born on November 22, 1955 in Dubuque, Iowa. He departed this life at his home on August 1, 2018 in Camdenton, Missouri at the age of sixty-two years, eight months and ten days. On September 5, 1975, he was united in marriage to Lynn Huseman and to this union two children were born. Together they shared forty-two years of marriage. Michael was preceded in death by his father. Survivors include his wife, Lynn Kuse, of the home; his mother, Kathleen Kuse- Henrichs and husband Robert of Camdenton, Missouri; daughter, Jennifer Shurtz and husband Ryan of O’Fallon, Missouri; son, Jason Kuse and Kate of Jefferson City, Missouri; five grandchildren, Ella, Kanyon, Grace, Kira and Hazel; three brothers; Dennis Kuse and Sandy of Camdenton, Missouri; Chris Kuse and Nancy of Camdenton, Missouri; and Dan Kuse and Denise of St. Charles, Missouri; and one sister, Karen Kolb and husband Michael of Evandale, Ohio; as well as a host of other relatives and friends. Michael was born and raised in Dubuque, Iowa where he married his high school sweetheart, Lynn. In 1985, Michael and Lynn made the lake area their home where they managed the Knotty Pine Resort for five years and raised their two children. 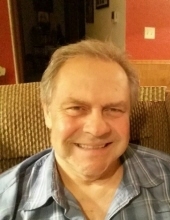 In his spare time, Michael enjoyed playing guitar, sitting in front of a campfire, and loved spending quality time with friends, family, and most of all, his grandchildren. Mass of Christian Burial will be celebrated at St. Patrick Catholic Church in Laurie, Missouri on Monday, August, 6, 2018 at 10:30 a.m. Officiating will be Father C.D. Ryan of St. Patrick Church. Visitation will be Sunday, August 5, 2018 at Allee-Holman-Howe Funeral Home in Camdenton, Missouri from 3:00 p.m. – 6:00 p.m., with a prayer service beginning at 3:00 p.m.
Memorial donations may be made to Hospice Compassus of Osage Beach, Missouri or St. Patrick Catholic Church – Knights of Columbus, Council number, 10381. To send flowers or a remembrance gift to the family of Michael Kuse, please visit our Tribute Store. "Email Address" would like to share the life celebration of Michael Kuse. Click on the "link" to go to share a favorite memory or leave a condolence message for the family.